Is your e-Learning course accessible? Take a look at this 5-step checklist to help you create a 508-compliant e-Learning course. One great thing about e-Learning courses is that the Internet removes communication barriers that many people with disabilities face in the real world. An online training course can enable all people to comfortably use it—but only if it’s designed well. You should design your e-Learning course to be accessible for everyone by being aware of visual, audio and other barriers. You also may have to make your course 508 compliant, which follows the guidelines of Section 508 of the Workforce Rehabilitation Act. If all your learners can’t access the content in your e-Learning course successfully, they will miss out on important parts of the online training. A good e-Learning course is accessible to people with a diverse range of hearing, movement, sight and cognitive ability. Is your e-Learning course accessible? 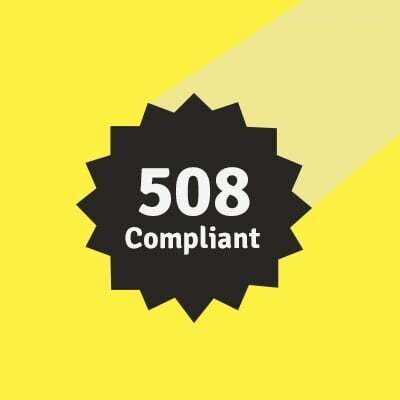 Take a look at this 5-step checklist to help you create a 508 compliant e-Learning course. Are all visual parts accessible? Provide alternative text for images. Alternative text (or alt text) ensures that images are still accessible for people who are blind because their screen reader will read the alt text aloud for any images. This allows everyone to know what images are included in your e-Learning course. Consider font sizing and color contrast. Most browsers now allow e-Learning developers to accommodate anyone who needs to have larger text to read comfortably. Also keep in mind your color contrast. Strong color contrasts make it easier for colorblind learners to view your content. Are all audio parts accessible? Provide a text transcript for audio files. Text transcripts make audio information accessible to people who are deaf or hard of hearing. This allows everyone to learn any information that’s presented in audio form in your e-Learning course. Include captioning for video files that include audio. Closed captioning will allow learners to read the audio portion of your video if they can’t hear it. This means they won’t miss out on any important information in your course. Does the course allow for keyboard input? Allow all functionality via a keyboard. Providing the option for complete keyboard control in your e-Learning course gives learners who cannot use a mouse the opportunity to use assistive technologies that mimic the keyboard, such as speech input. Does my authoring tool support accessibility? Choose an authoring tool that supports accessibility. This will make it easier for you, as a developer, to make your course accessible to all your learners. Lectora e-Learning software is built with easy-to-use functions to help you create engaging and interactive accessible e-Learning courses. Incorporate user testing into your development process. Getting frequent feedback as you’re creating your e-Learning course will allow you to fix any areas that aren’t accessible—before it’s too late. This will save valuable time and help you plan ahead to correct any issues before they become problems for your users. Use this checklist to help you create accessible e-Learning courses, so your learners can have the best possible e-Learning experience! For more information on accessibility and what it means for e-Learning development, check out this whitepaper: What Does Section 508 Compliance Mean for Your e-Learning Course?